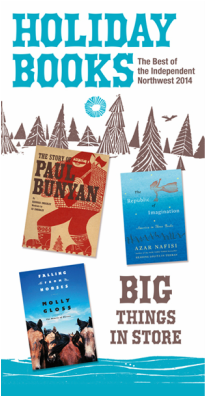 PNBA's Holiday Catalog is an advertising vehicle for our member bookstores, emphasizing the Best of the Northwest with a wide variety of books that our store members will be excited to stock and sell during the busiest gift-giving season of the year. Publishers pay for placement of each title in the catalog and all of the titles must be available from at least one of the major NW book distributors. The entire design, production, and distribution of the catalog is paid by the Association, and we also reimburse our members for part of their costs to insert the catalog in their local papers during the holiday season, if they provide us with the proper sales reports and invoice copies. Many of our store members tell us that the holiday catalog is their single most effective advertising each year, and that their November and December sales would be seriously reduced if they did not have the catalog as part of their promotions. Booksellers who are looking for ways to enhance their sales during the holiday season are encouraged to contact PNBA to learn more about how you can use the catalog to your best benefit. Publishers who believe you have a book that would make a great addition to the catalog are urged to contact us before July each year. PNBA's fall show is the primary activity of the Association. The shows bring together publishers and their sales reps with NW booksellers, librarians and authors, in a professional gathering, to emphasize promotion, education, and camaraderie. In recent years more than 200 booksellers from more than 100 Northwest stores have met with more than 200 exhibiting publishers and their representatives, 100+ authors, 30+ librarians, and another 60+ publicists and such industry colleagues, to bring total show attendance to more than 600. We invite and encourage any NW bookseller, librarian, or author to contact us about participating in our shows. Since 1965 the PNBA has presented annual awards to recognize excellence in writing from the Pacific Northwest. Rather than soliciting nominations for specific categories, we simply require that the author and/or illustrator reside within the PNBA region (Washington, Oregon, Alaska, Montana, Idaho and British Columbia) and that the book be published within the current calendar year. In addition, nominations may be submitted for special awards honoring efforts in publishing, illustration, or for a body of work. Special awards are determined at the discretion of PNBA's Book Awards Committee. The Rural Library Project is a program designed to put books into small, rural libraries, in our region, that have very limited funds for acquisitions. Recipient libraries are recommended and chosen each year by our member bookstores. At our annual Fall Show, vendors are asked to donate some or all of the sample books from their show displays -- rather than shipping them back to their publisher's warehouses. Our volunteers collect these books and give them to the chosen library. Our generous publishers and reps donate thousands of dollars worth of books each year to small libraries in the region.